Have you felt the need to get back to that slim fit shape you once had before you became pregnant? A lot of women wish to return to this shape, but most don’t because of a tight schedule, no idea of what to do or where to start from. Besides the physical appearance (the slim fit beautiful shape), research has shown that exercise after childbirth has immense benefits. Working out after childbirth helps strengthen and tone your abdominal muscles that have become lax due to your pregnancy; improves your heart function and endurance; boosts your mood, thereby lowering the risk for depression which may occur due to the stress of taking care of your newborn baby or occasional hormonal changes in your body. 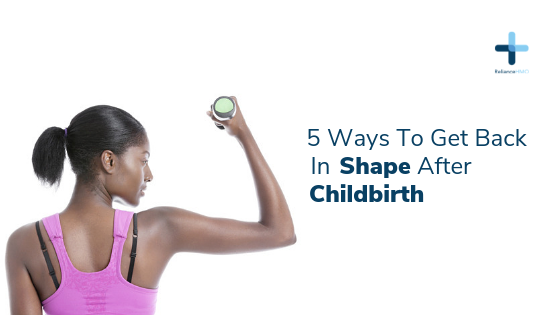 This is the easiest way to start exercising after childbirth. You can start with evening stroll, walking as far as any strength you have can carry and stopping once you’re tired. You can take your baby with you in a front pack or in a baby stroller. Making this a routine like 3 to 5 times a week will help you burn calories which leads to a gradual reduction of that pregnancy weight; it will also improve your endurance. Eating very healthy will provide your body with the necessary nutrients to rebuild as you gradually increase the distance of your evening walks. Regular breastfeeding (exclusive breastfeeding) which burns around 300 calories a day, coupled with your walks, means you’re expending calories than you’re taking in and that will equate to a gradual loss of your pregnancy weight. While you’re taking your routine walks, eating your healthy, balanced meals, or after breastfeeding, don’t forget to have your bottle of water by your side. Ensure you drink water regularly as it is needed by your body in every process of energy production and expenditure. Taking water in a situation where the body is spending more calories than it is taking in (due to your routine walks and regular breastfeeding) will further encourage this high metabolic state, leading a slimmer body as weeks and months roll by. This is used to strengthen your abdominal muscles that are probably loose from pregnancy. This is a home exercise you can do. This is what it entails: lie down on your back on a floor mat, bend your knees, now try to tighten (squeeze) your abdominal muscles and raise your pelvis (your hip region) up a bit from the floor, hold yourself in this position for about 5 to 10 seconds. You can do up to 10 reps of this for each set and up to 5 sets a day. It won’t be easy but target doing this at least 3 times a week. As you recover from your pregnancy state and gradually build endurance towards to the third month after childbirth, you can start taking low-pace short distance jogs, something in the range of 1 to 2km. This will help you build more endurance and tone your whole body in the process. Getting back to shape after childbirth is not something easy because of the overwhelming responsibility of taking care of your newborn baby. So don’t get discouraged if you miss any of these for a few days, just make sure you’re persistent. In addition, getting your husband, family relatives and friends to support you, and maybe join in some of these exercise programs like walking or jogging, can be a big motivation. For women who gave birth through cesarean section, you should wait for at least 6 weeks for your body (tummy) to heal and make sure you are directed by your doctor and physiotherapists on what exercise programs to take up before attempting anything. Always remember to stop at once and see your doctor if you experience bleeding or headaches or feel abnormally unusual during or after any of workout program after childbirth.